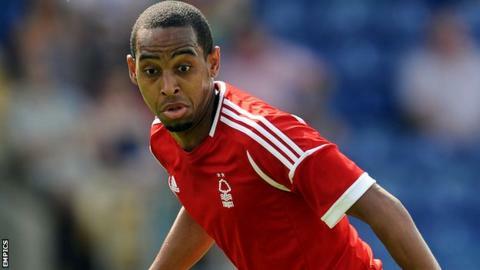 Nottingham Forest striker Dexter Blackstock has been charged with "multiple breaches" of betting rules by the Football Association. FA rules say a player "shall not bet, either directly or indirectly" on matches involving themselves or their team as well as the competition they play in or have played in. Blackstock, 27, has until Monday, 28 April to respond to the charge. He played only three times for Forest this term before joining Leeds on loan. Blackstock was then ruled out for the rest of the season with a knee injury in December. Rule E8(b) of the FA's regulations also says that players are prohibited from betting in "any other matter concerning or related to any club participating in any league competition that the participant is participating in or has participated in during that season". League One side Tranmere Rovers sacked manager Ronnie Moore earlier this month after he admitted multiple betting breaches of the rule. Newcastle midfielder Dan Gosling was fined £30,000 in March for breaching betting regulations, while Barnet right-back Andy Yiadom was fined £1,000 in February and warned about his future conduct regarding FA Rule E8(b). Blackstock signed a four-and-a-half year contract extension last season, but has not featured for the City Ground club since October. He is currently seeking damages at the High Court after a tackle in 2010 resulted in him being sidelined for more than a year.